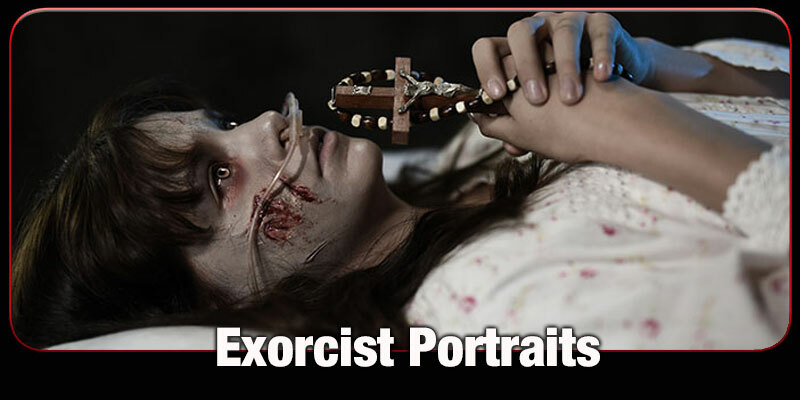 The ultimate story of demonic possession, the classic Exorcist makes an unusual and exciting portrait shoot experience. 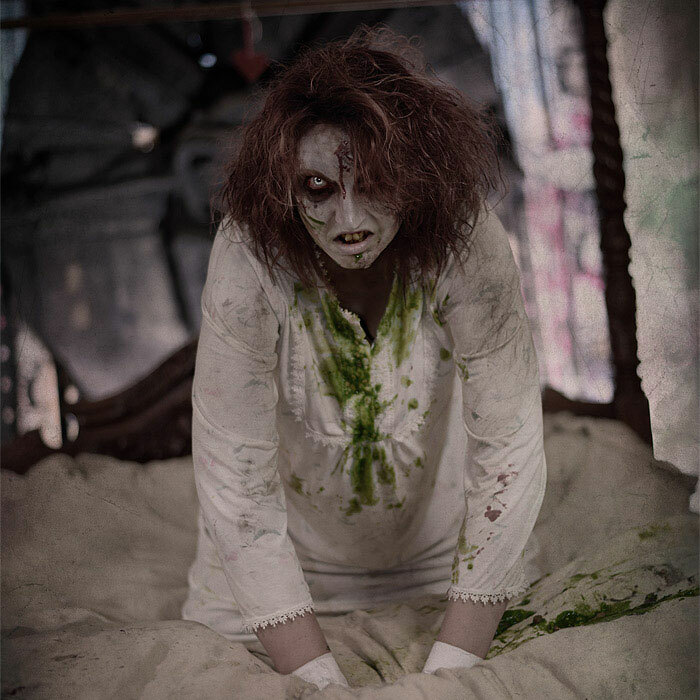 • In this dramatic photoshoot, you will be photographed in your nightgown and in a bed, shown in various stages of demonic possession, vomiting green puke, and expressing angry, evil faces. • You will be directed by the photographer into terrifying poses which will feature a lot of fake blood and some fake vomit. 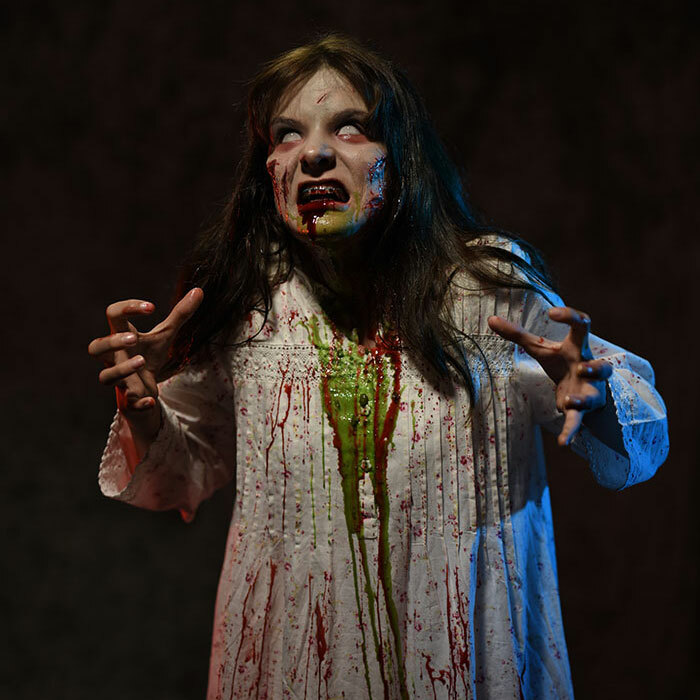 • This is a very gory portrait photoshoot in which you will become demonically possessed! The actual shoot is a lot of fun and not scary to do, but the resulting photos are very scary! • Maximum x2 people. A solo shoot will feature you as the possessed individual. A two-person shoot will feature the second person as a priest or victim. At the start of the shoot you'll be made to look very ill. No doctor can figure out what's wrong with you, so you resort to praying with a cross for your recovery. No Exorcist shoot is complete without the famous green puke. A second person can be in the shoot either as a priest who performs an exorcism, or as a victim that you can assault in all kinds of unpleasant ways. • A long pale coloured nightgown. These can be purchased fairly cheaply on Ebay. It's best to use white or pale blue but you can choose different colours if you wish. Just please avoid dark colours or reds or the blood won't show up. • Please keep in mind that whatever clothes or costume you bring may suffer damage or be utterly ruined by the end of the shoot. We use a LOT of blood at Horrify Me! • Feel free to bring any appropriate props if you have any that you would like to use. • You may bring your own eye contacts for scary eye effects if you want to. We don't supply contacts. • Please bring a towel for clean-up at the end. • Horrify Me will supply all the fake blood and horror make-up, so you will not need to bring any of this. • Age 13 and over only. All children under 16 must be accompanied by a parent or responsible adult and a consent form must be completed.